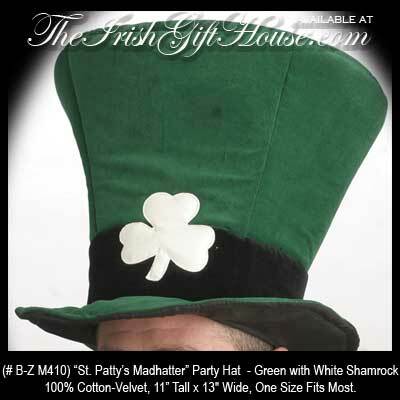 Wear this tall Irish hat and you may become the world's tallest leprechaun on St. Patrick's Day. The leprechaun hat features a shamrock and is in the mad hatter style. This St. Patrick's Day hat features a cotton lining and a 1/4" thick foam interior that will provide durability and support. The leprechaun hat also has wire in the brim for custom shaping. This St. Patrick's Day hat prominently features a bold shamrock and would be the finishing touch of your leprechaun costume. The green leprechaun hat from The Irish Gift House is constructed of a cotton and velvet blend and measures 11" tall x 13" wide and the one size with its adjustable Velcro strap will accommodate most head sizes.